Distinguished professor of creative practice and director of the Centre for Creative and Cultural Research at the University of Canberra Jen Webb said the Poetry on the Move symposium on Friday 1 May, fostered critical thinking and a two-way conversation between writers and their audience. “Events like this deepen our networking, but also allow writers, readers and scholars the opportunity to tease out issues of importance or concern and to begin building ways to address these topics,” Professor Webb said. 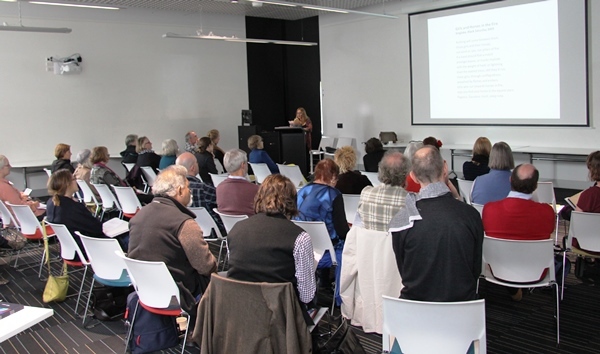 Participants in the symposium presented papers on their chosen topics, which discussed issues from the Black Saturday Bushfires to data visualisation in poetry and madness. 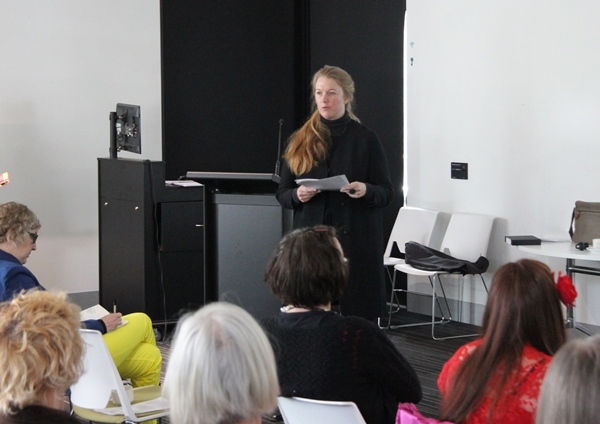 The University of Canberra’s Monica Carroll turns a critical eye towards the use of data visualisation in poetry during her presentation during the 'From Darkness into Light' symposium. Lisa Jacobson reflects on the Black Saturday Bushfires of 7 February 2009 in her presentation Out of the Darkness. “We encourage our presenters to put their papers forward for peer-review and publication within the International Poetry Studies Institute journal Axon: Creative Explorations, giving them an opportunity to extend the conversation well beyond the symposium,” she said. Probing questions from the audience also prompted further discussion among the poets and delved into their thinking in creating their critical works. Professor Webb said questions will often spark new avenues for investigation or even help forge a new collaboration for future work. “Through a question-and-answer session, the audience benefits too, by having the opportunity to seek clarification, offer a different perspective and have their own perceptions of a presentation filtered by the sorts of questions asked and answers given after the presentation,” Professor Webb said. The International Poetry Studies Institute (IPSI) is based at the University of Canberra. It conducts research related to poetry and publishes and promulgates the outcomes of this research internationally. The University of Canberra Vice-Chancellor’s International Poetry Prize is accepting entries until 29 May 2015. Details are available via the VC Poetry Prize website.